The Synergy Cover 94 mixer tap collection is characterized by its smooth, fluid and completely asymmetrical forms inspired by nature. Each object has shapely and manifold contours that continuously vary depending on the observation point, constantly mirroring the materials. 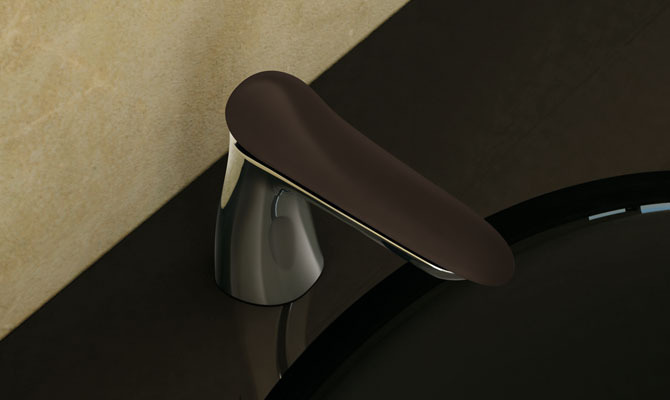 Designed for those who love the use of simple gestures and inspired by a classic "mood", Synergy Cover version stands out for the covered form of its lever in respect to the body of the tap. 1. 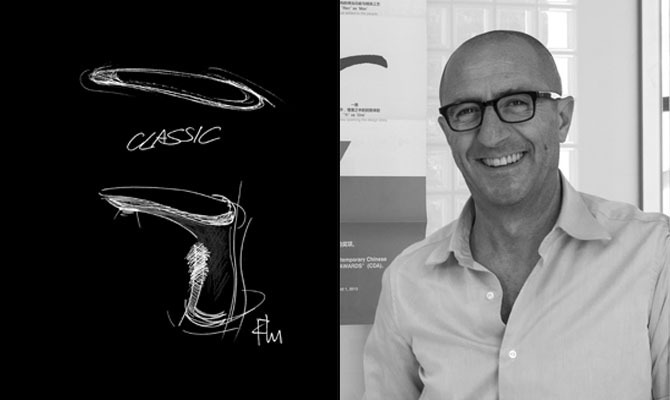 Organic, new and innovative design, that takes its inspiration from nature. 2. Three tastes, which give rise to three different bathroom collections: Synergy Open 93, Synergy Cover 94, and Synergy Stone 95. 3. The use of color through the material: DuPont™ Corian®. 4. Ideas for Contract, with special customization possibilities. The "Cover" lever extends out over the spout, covering it completely, and is reminiscent of desert dunes shaped by the blowing wind. 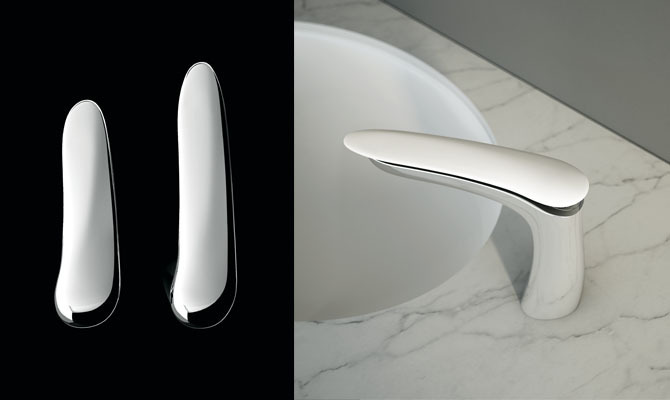 Synergy Cover 94 taps are available with the handle in chrome or in DuPont™ Corian® finishing. Synergy Cover 94 offers the widest choice of deck-mounted taps out of the products in the catalogue, with various spout lengths. This flexibility allows you to choose any type of built-in or semi-built-in basin to combine with the mixer taps. Wash basin mixer, 140 mm high, center distance 110 mm long, without pop-up drain and hole for pull-rod. Wash basin mixer 140 mm high, center distance 110 mm long, with pop-up drain and pull-rod. Wash basin mixer, 140 mm high, center distance 135 mm long, without pop-up drain and hole for pull-rod. Wash basin mixer 140 mm high, center distance 135 mm long, with pop-up drain and pull-rod. Wash basin mixer, 300 mm high, center distance 150 mm long, without pop-up drain and hole for pull-rod. Wash basin mixer, 335 mm high, center distance 165 mm long, without pop-up drain and hole for pull-rod. External part for wall-mounted built-in basin mixer with plate, 195 mm long, center distance 165 mm long. External part for wall-mounted built-in basin mixer with plate, 255 mm long, center distance 225 mm long. External part for floor-mounted wash basin mixer, 1100 mm high, centre distance 200 mm long, with shelf in DuPont™ Corian®. Wall-mounted water spout 1/2'', center distance 165 mm long, complete length 195 mm. Wall-mounted water spout 1/2'', center distance 225 mm long, complete length 255 mm. Deck-mounted mixer for water spout. Bidet mixer, 140 mm high, center distance 110 mm long, with pop-up drain and pull-rod. Wall-mounted bath mixer with diverter and shower set. Wall-mounted bath mixer with diverter and flex hose connection. Three-hole deck-mounted bath mixer with diverter and shower set, without spout. Assembly system for deck-mounted bath mixer with floor fixing. Assembly system for deck-mounted bath mixer with deck fixing. External part for floor-mounted bath mixer, with diverter, shower set and shelf in DuPont™ Corian®. Wall-mounted water spout 3/4'', center distance 165 mm long, complete length 195 mm. Wall-mounted water spout 3/4'', center distance 225 mm long, complete length 255 mm. Deck-mounted water spout, center distance 200 mm long, 120 mm high. External part for wall-mounted built-in one-way shower mixer. External part for wall-mounted built-in shower mixer with two-way diverter. External part for wall-mounted built-in shower mixer with three-way diverter. External part for wall-mounted built-in shower mixer with four-way diverter. External part for wall-mounted built-in thermostatic shower mixer with stop valve. External part for wall-mounted built-in thermostatic shower mixer with stop valve and two-way diverter. External part for wall-mounted built-in thermostatic shower mixer with stop valve and three-way diverter. External part for wall-mounted built-in thermostatic shower mixer with stop valve and four-way diverter. Wall-mounted shower mixer with flex hose connection. Built-in hand shower set with wall water inlet. Vertical bar with hand shower, flex and wall water inlet. External part for wall-mounted built-in straight stop.